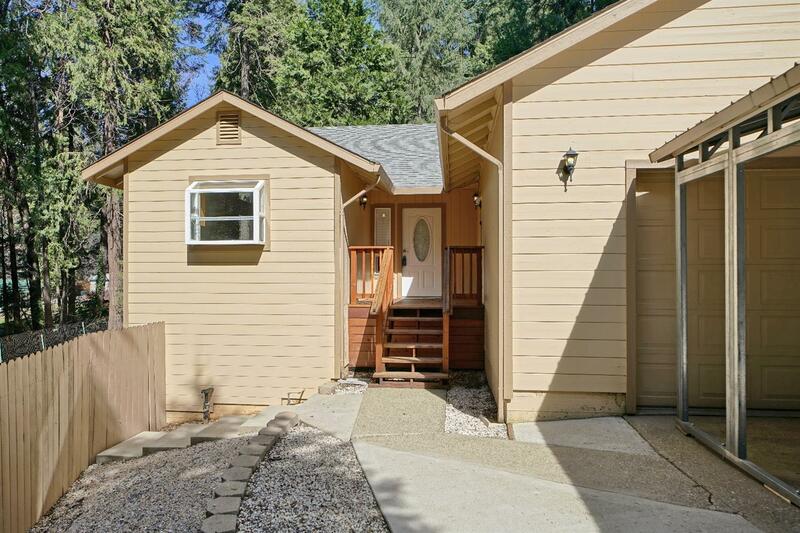 Don't miss this beautifully kept 1600 square foot home with 3 bedrooms and 2 bath. A great kitchen and dining area are perfect for any gathering you plan. The open beamed ceilings in the dining area and living room are exceptionally nice. The living room has a glass slider that leads to a new deck and back yard with a great outbuilding that could easily be used for an office, crafts room or just a place to escape. A large master bedroom has a fun sitting area, walk-in closet and slider to the back deck as well. An inside laundry area is conveniently set in the hallway. The large 2 car garage is awesome as is the new carport in front of the house. All this sits on a large usable parcel with beautiful mature trees, level land and well maintained homes as neighbors. Come see this wonderful home you will not be disappointed.